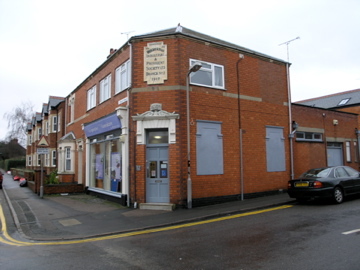 I have been trying to discover if anybody has written a history of the Co-op in Wolverton, without success. There are fragments of information that I have turned up, but not enough to write a coherent account. Here at any rate are some notes. The Co-op movement was more-or-less contemporaneous with the development of Wolverton so it was to be expected that the idea would take hold. Exactly how it was formed and who were the prime movers will require the work of some historian with access to the minute books and papers of the Co-operative Society – if indeed they still exist. It does strike me as a story worth telling because by the middle of the 20th century the Co-op was a dominant force in retail in Wolverton. 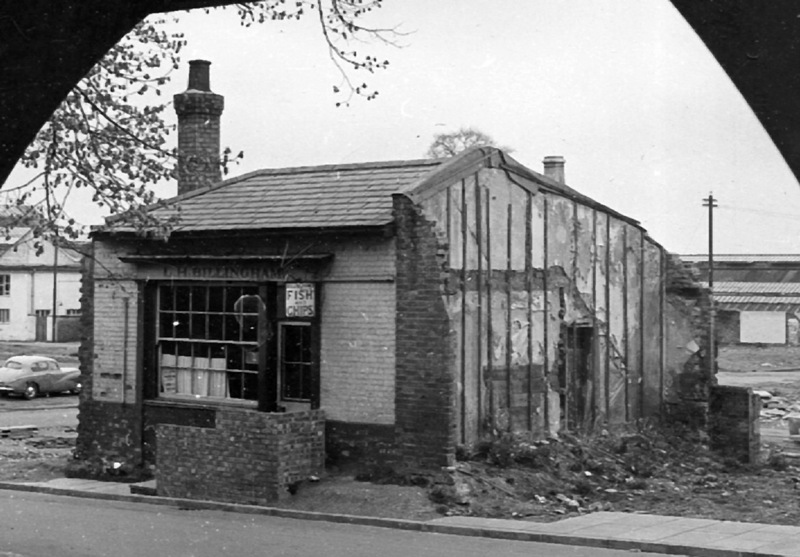 After all the small dairies in Wolverton were closed down by the requirements of the Pasteurisation Act, the only source of supply of milk and dairy products was the Co-op Dairy, located on Jersey Road. You could, if you were so minded, buy everything you ever needed in life from the Co-op – bread, milk, meat, groceries, fish, green groceries, drapery, men’s clothing, shoes, furniture, toys, and even in death the Co-op could accommodate you and arrange your funeral. As far as I can piece together the story from Trade Directories the Co-op story began a decade after the establishment of Wolverton. There is a suggestion that the bakery on Bury Street, operated by George Kightley, from a Stony Stratford family of bakers, was a Co-op bakery, but this is only a brief mention in some railway committee minutes that I cannot be sure of this fact. The Kightley bakery ran from the day these shops were erected in 1839 until about 1856 when they were pulled down to make way for workshop expansion. 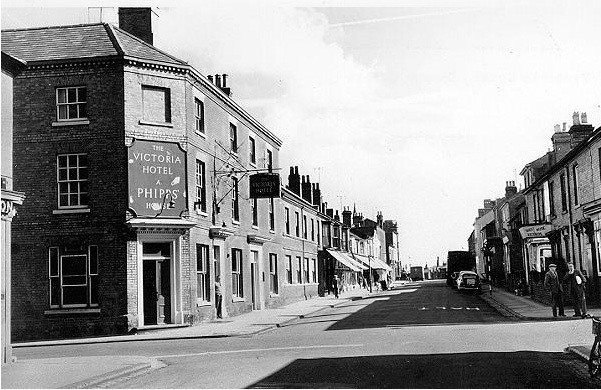 Kightley thereafter moved to Newport Pagnell where he ran a bakery in Silver Street. The Co-op story certainly begins with the building and opening of the shops in Creed Street and the Co-operative Society is featured in the Kelly’s directories of the period. In the 20th century the Creed Street shop was known as a Fish and Chip shop, but until the Co-op began to expand along Church Street this grocery store was the main outlet. By 1869 the Co-operative Society had also opened a grocery shop in New Bradwell. In 1887 we see the first mention of the Wolverton Industrial and Provident Society, presumably a re-formed or re-named organisation. It was based in Church Street and I can only conclude that this was the beginning of Co-op expansion. The shop was probably Number 15. The location of this shop is on the right hand side in this 1960s photograph, beside the striped traffic pole. At about this time or shortly after there was a further expansion to the new Market Square and for many years after the main office was established here. 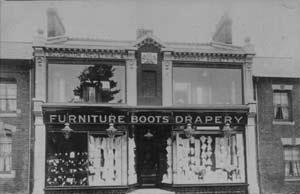 Unfortunately the exact addresses are not given and of many years after the Co-op sought to advertise its presence in the directory by listing itself only as Market Square. It is really not until 1928 that we find a comprehensive listing of addresses of places where the Co-op did business. This is the configuration that most people would recognise in the mid century when the Co-op was at its peak. I am not sure of the date of the picture below, but I suspect from the architecture and the large plate glass windows that it is late 1890s or early 1900s. This was probably at the time Wolverton’s most splendid shop. as you can see from the photo the houses either side, Numbers 3 and 6 are still residential. Did the Co-op own Numbers 1 and 2? Possibly. They certainly did at a later period. The new Co-op on the Square. 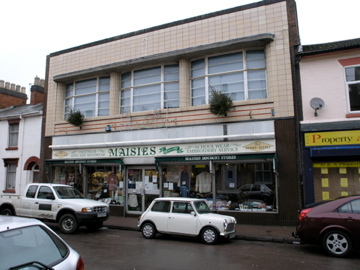 Once the west end of the town was developed in the first decade of the 20th century, the Co-op also moved westwards, establishing a grocery, dairy and butcher’s shop on Jersey Road. In the late 1920s there was a further expansion as the Co-op bought three houses on Church Street and built a state-of-the-art department store. And it further expanded along the Square to take up the first five houses from the corner. Behind the grocery was a bakery, and the shop at the corner of Bedford Street was a Co-op butcher and later an outlet for bread and confectionery. Obviously the co-op has not gone away; it has had to grow to larger superstore outlets with plenty of parking. The Wolverton Co-op shops, as they were, represent an age when shopping could be done on foot, daily, with hand-held wicker baskets. The Wolverton Industrial and Provident Society probably had its weaknesses, but its great virtue was that it was locally owned and operated. You can hardly say that of any retail outlet these days.